PDR stands for Paintless dent removal – a process that rids your vehicle of dents and dings without the need of a pricey paint job. PDR services available on site to bring your car back to showroom condition! At Tucker’s Collision Center in Las Vegas, we treat every vehicle body & paint repair like it’s our own. We place passion behind every job that we do. From minor abrasions to larger dents, we are always looking for ways to improve our collision services. We work with all major insurance companies to provide convenient and stress-free dent repair service. If your body damage is not covered by insurance, we want to help you stay within budget with affordable pricing. Our certified technicians have experience with innovative body damage repair techniques. Paintless Dent Repair is one of the cutting-edge techniques that our bodywork experts use to provide value to our customers. While many traditional auto body shops use old protocols, we use paintless dent repair, which is the latest innovation in automotive dent repair. Paintless Dent Repair is an art that requires patience, finesse, and extraordinary attention to detail. Not just any mechanic can accomplish the same quality that we expect with Paintless Dent Repair service by a certified technician. Our competitors continue to use old methods and tools like drilling holes in the vehicle body or using a hammer to bang out body damage. 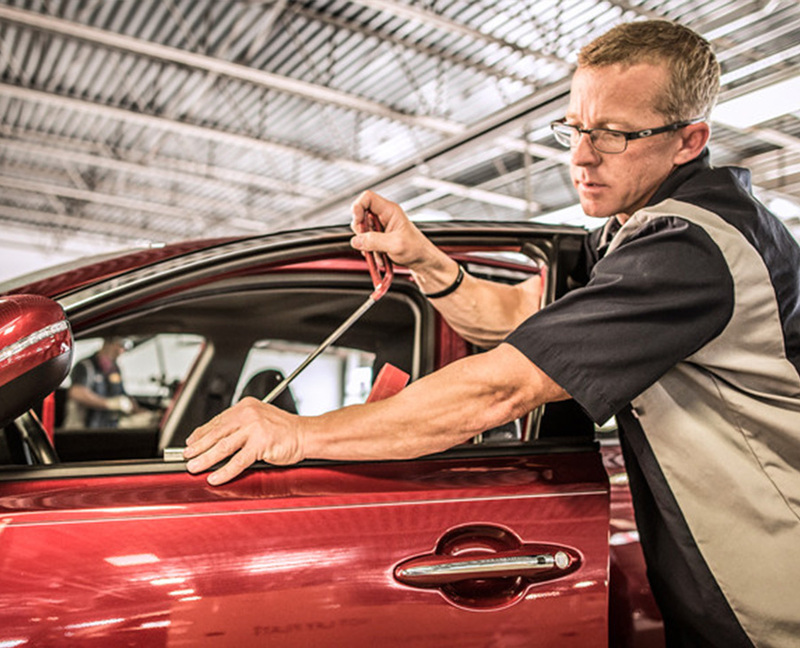 This is not the best because our GM certified technicians use patience and finesse to massage out dents and dings, tediously, one by one, from the backside of the damaged panel to make sure that your vehicle is restored to its original luster. Don’t trust your body and paintwork to any service provider because they say you will save a few bucks. All GM certified collision centers have passed a rigorous testing process to ensure that every vehicle is treated with the greatest respect and is repaired correctly the first time. Our GM certified technicians only use the highest quality standards, state-of-the-art dent removal equipment, and technologies that ensure all body damage is fixed to restore your vehicle to pre-damaged condition. If you have body damage to your vehicle, you can restore the body to factory-like condition by scheduling an appointment at Tucker’s Collision Center in Las Vegas. We have a team of GM certified body repair experts ready to restore your vehicle’s body to its original condition. Schedule an appointment today at Tucker’s Collision Center in Las Vegas to have one of our body and paint experts provide you with Paintless Dent Repair service. Schedule your appointment with Tucker's Collision using the form below. One of our team members will get back to you as soon as possible to confirm your appointment. If you have any questions, feel free to give us a call at 702-220-4660.